The GET CO-93-A plate cover is designed to fit plates with diameters between 9.7 and 10.4 inches to protect their contents from contamination and temperature loss. It is made of BPA-free and dishwasher-safe polypropylene. 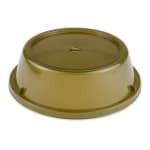 The cover’s amber color can be used to designate it for use with hot foods, and a hole in the top of the unit allows steam to vent, which can help protect against burns and prevent condensation buildup that can make food soggy. The GET CO-93-A plate cover is tall enough that it can accommodate most foods. Fits plates with diameters from 9.7 to 10.4 in.